I think there is a common misconception among many people that in order to be healthy you must eat “perfectly”. I use the word perfectly loosely because it means different things to everyone. Ironically though, many hold tight to this ideal. For some it means eating low carb all the time, others it is eating only Paleo and for many it means never eating anything deemed as unhealthy if you wish to be a vibrant human being. I am here to tell you it is all hog wash! Why? Because life is not perfect and health is not perfect. For most of us what we are really looking for when we say healthy is a certain feeling. Generally that means having energy to keep up with all that is important to us, being free of disease and just simply feeling good in our own skin. You’re probably wondering why on earth I am rambling on about health. 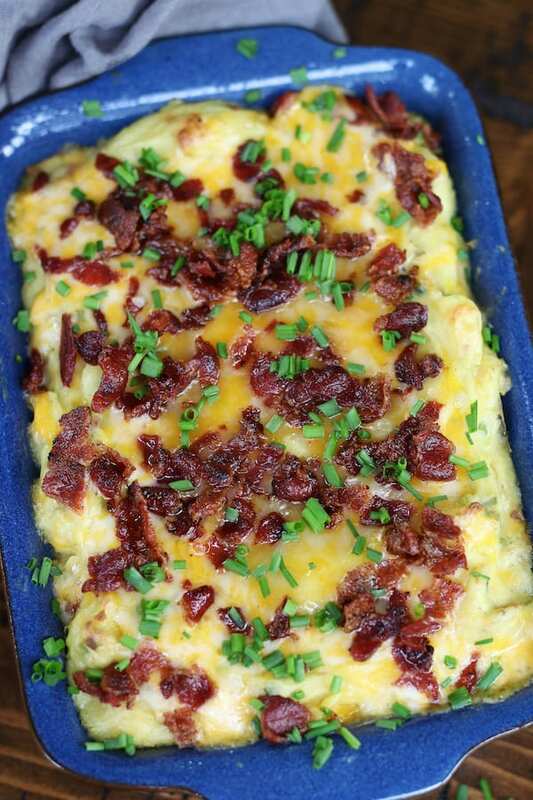 Because my friends, this Twice Baked Mashed Potatoes recipe is anything but diet food. 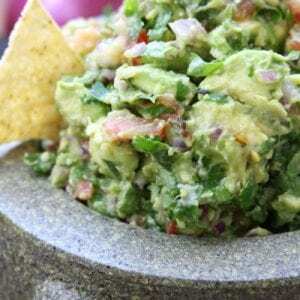 It is a soul satisfying, from the first bite to the last, experience that is just sometimes necessary. It feels like a giant warm hug. After almost 10 years of guiding people to their weight loss goals here is the secret I have learned about healthy eating… Just don’t eat like this all the time. Revolutionary I know… But seriously, the secret really lies in saving recipes like this for an occasional treat. 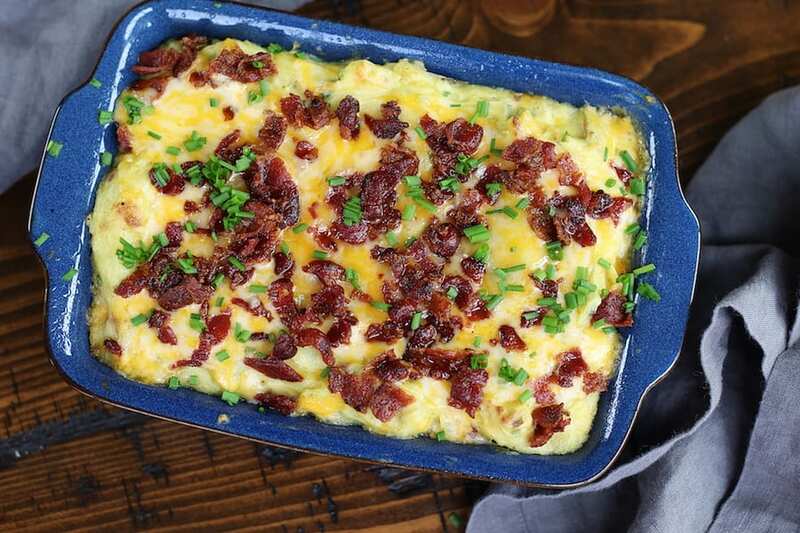 Savor the ooey gooey deliciousness of the melty cheese, crispy bacon and soft mashed potatoes and then get back with the eating approach that works best for you. Making peace with the fact that you enjoy sinfully decadent foods and then figuring out how to incorporate them occasionally will be one of the most mind freeing gifts you can give yourself in this lifetime. 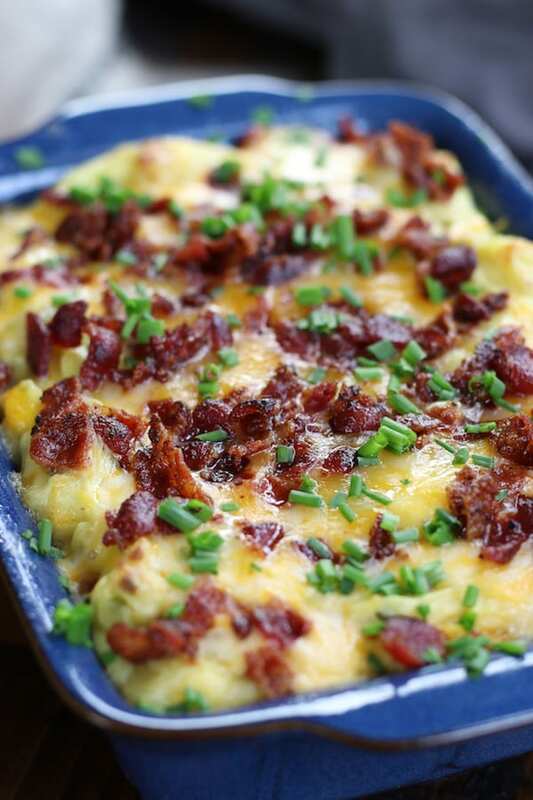 Here is the easiest approach I have found for making Twice Baked Mashed Potatoes. Fry bacon over medium heat. Once crisp, let rest on paper towels to absorb extra fat. Cut into crumbles. Use smaller Yukon gold potatoes, cut and boil until just fork tender but not falling apart. Drain. Add cooked potatoes back into pot and butter, sour cream, half and half, salt, pepper and garlic powder to potatoes and using an immersion blender, blend until creamy. Stir in half of grated cheese and diced bacon. Place potatoes into a greased small baking/roasting pan and bake in a 375℉ oven for 20 minutes or until golden brown. Remove from oven and add remaining cheese and bacon and continue baking an additional 5 mins to melt cheese. Creamy cheese that melts easily works best for this potato casserole. Although I love Colby Jack the best for this recipe, here are a few alternatives. 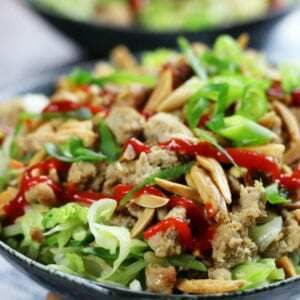 There are two ways to make this recipe just a little healthier. Switch up the ingredients a bit by replacing the sour cream with nonfat Greek yogurt, whole milk instead of half and half and lowering the cheese down to 2 cups. Add sautéed spinach. Place a medium sized frying pan over medium heat. Add 1 tbsp olive oil and 1 large clove of garlic. Sauté for 1 min and then add 8 oz of fresh spinach that has been cut. Sauté until lightly cooking and stir into potatoes at the same time as the bacon and cheese. There are approximately 300-350 calories per serving of these potatoes when the full fat versions of the ingredients are used. 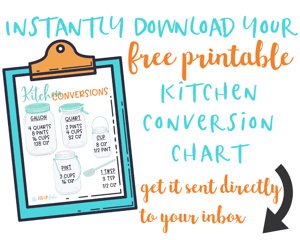 Please see tips just above to help lower calories if needed. This potato cheese casserole can be made a day in advance and still taste phenomenal. For best results, follow the recipe up to step 3 but reserve the baking for just before serving. 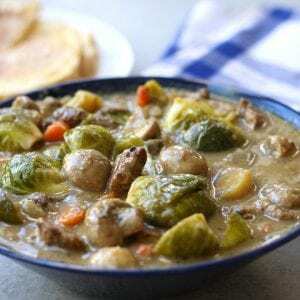 An absolute comfort food must have that is perfect for family dinners and/or holidays. 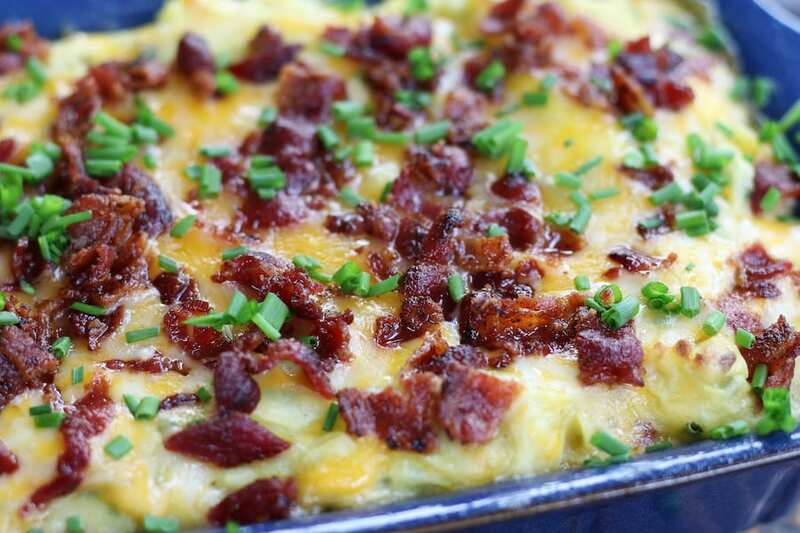 It's oeey gooey creaminess with bacon, chives and loads of flavor. Place half of bacon strips into a large cold frying pan. Place pan over medium heat and fry until crisp, making sure to turn strips a few times. Let cool on a paper towel. Once cooled diced into bacon bits. Set aside. Cut potato into 1/4s and place into a large stock pot. Cover with water 1 inch above tops of potatoes. Sprinkle in salt and bring to a boil over high heat. Once boiling lower heat to medium/low. Cook potatoes until fork tender but not falling apart, about 8 mins. Drain and add cooked potatoes back into pot. Add butter, sour cream, half and half, garlic powder, salt and pepper. 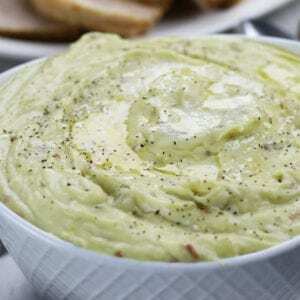 Using either a potato masher or immersion blender, blend potatoes until well mashed and creamy. Add in grated onion, half of the cheese, half of the bacon and part of the chives. Stir well. Spray a small roasting pan (approximately 14 x 10 inches) with nonstick cooking spray. Spread mashed potatoes evenly into roasting pan and bake for 20 mins or until potatoes start to become golden brown on top. 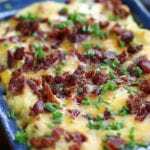 Remove from oven and sprinkle with remaining cheese amid bacon. Continue baking for an additional 5-7 mins or until cheese is melted and bubbly. Remove from oven and garnish with remaining chives.